Finding More Writing Time, Focus and Freedom (for freelancers) | Writing & Book Coach | Marla Beck, M.F.A. Rebecca, a freelance journalist and content marketer, has a stable, successful writing career. After a few focused years of freelancing, she’s got a full assignment load, a good writing income and a couple of bylines she’s really proud of. Like any good independent business owner, Rebecca set clear targets for her earnings, her reach, her performance and more. And being the highly capable writer she is, Rebecca systematically met (and in some cases, exceeded) every single target she set. Given her independent schedule, her solid reputation, her ample assignments and her good income, why, then, does Rebecca feel so “meh” about her writing career? Why is she experiencing more and more days of dread or boredom, as she sits down to work at her computer? Why, on three-day weekends or vacations or nights when she can’t sleep, is Rebecca haunted by an insistent, terribly uncomfortable feeling that time is ticking? That yes, her career looks great on paper, but deep inside she knows she’s off-track. That when she’s brutally honest, she feels – she knows — that, despite her successes, she’s really not yet living up to her full potential as a writer? And what happens if Rebecca puts off answering these tough questions for three, give or even ten more years? She’ll risk falling terribly OUT of love with her work (no matter how good the money). She’ll get annoyingly jealous when her writing friends set and achieve meaningful goals, when she sees their bylines in dream magazines or attends their book talks. Worse, she’ll have to live with the knowledge that she received calls from her heart that she chose to ignore, postpone or bury under unfulfilling writing assignments and overly busy days. Rebecca needs a renewed sense of purpose in her writing. She needs practical help to take charge of her freelancing schedule, time and business. Rebecca needs FREEDOM, fire and purpose, so she can freely pursue the stories and writing projects she cares most about – without feeling guilty, doubtful or stressed. Real freedom as a freelancer is the ability to earn great money and to use your talent to build a career you deeply respect. 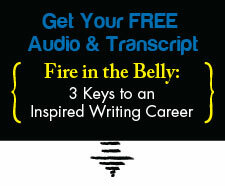 What does a truly free writing career look like for you? report the stories you most care about? publish your work in dream magazines? build a knowledge base and platform that enable you to impact the world with your perspective, your passion and your insight? I’ve been helping writers like you to achieve their biggest goals for over 12 years, and what’s more, I’ve made some of the same time, energy and focus mistakes you may be struggling with (so I know first-hand how painful they can be). All it takes to transform your freelancing career is a willingness to grow. Are you ready? If so, I’ll look forward to talking with you soon. Next post: Struggling to write what matters most? This is the step you’re missing.